By tapping former Attorney General William Barr to head the Justice Department again, U.S. President Donald Trump has picked a highly experienced Republican lawyer who is not known as a partisan in the same vein as ousted Attorney General Jeff Sessions. Barr, 68, served as first deputy attorney general and then as attorney general from 1989 to 1993 under the late President George H.W. Bush. 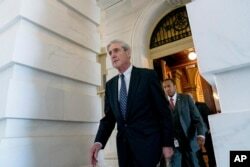 While leading the Justice Department, Barr oversaw independent counsel investigations of Reagan and Bush White House officials, an experience his supporters say lends him the credibility to oversee Robert Mueller's independent probe of Russian interference in the 2016 U.S. election. Barr also has held what critics see as sweeping views of presidential power, however, and at times has expressed skepticism about past and present independent counsel investigations. Those views, along with Barr's critical statements about the Mueller investigation, are drawing scrutiny from congressional Democrats who worry about the independence of the probe under a new Trump-appointed attorney general. 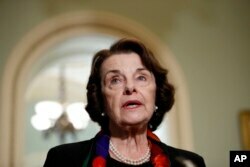 FILE - Sen. Dianne Feinstein, D-Calif., speaks to reporters on Capitol Hill, Oct. 4, 2018, in Washington. "There is no question William Barr is an experienced lawyer, having previously served as attorney general," California Sen. Dianne Feinstein, a Democratic member of the Senate Judiciary Committee, said in a statement. "However, there are concerns about his independence, given his expansive views of executive power and partisan statements about pardons, the Mueller investigation and Hillary Clinton." But supporters of Barr's nomination say those concerns are unfounded. "He's going to have a very deep respect and commitment to the institution of the Department of Justice," said Eric Jaso, a former federal prosecutor who is now a partner at the Spiro Harrison law firm. "I suspect that given his history and his reputation in Washington that he'll have a fairly hands-off, as appropriate, attitude toward the investigation." Barr was unanimously confirmed by a Democratic-controlled Senate in 1991 to be Bush's attorney general. If confirmed again, Barr will replace acting Attorney General Matt Whitaker, whom Trump appointed last month after forcing out Sessions. Trump had repeatedly criticized Sessions for recusing himself from the Russia investigation, blaming that move for the eventual appointment of an independent counsel with a wide mandate to probe Trump's campaign and actions as president. Barr has spent most of his career in the private sector, with two stints at the Justice Department. While heading the Justice Department in the early 1990s, Barr oversaw two independent investigations. The first, a sprawling inquiry carried over from the Reagan administration, examined the Iran-Contra affair, a 1980s political scandal involving the secret sale of weapons to the Iranian government and transfer of the proceeds to the U.S.-backed Contra guerrillas in Nicaragua. The seven-year investigation, led by independent counsel Lawrence Walsh, led to the indictment of nearly a dozen people, including former Defense Secretary Caspar Weinberger. But Barr remained harshly critical of what he considered Walsh's prosecutorial overreach. As Walsh recalled in a 1998 book about the investigation, Barr "believed some of our defendants should not have been prosecuted." "People in this Iran-Contra matter have been prosecuted for the kind of crimes that would not have been criminal or prosecutable by the Department of Justice, applying standards that we have applied for decades to every citizen," Walsh quoted from a December 1992 interview Barr gave. The second investigation was launched in the final weeks of the Bush presidency, when Barr appointed a special prosecutor to investigate whether White House officials had violated the law in connection with searching Bill Clinton's passport files during the presidential campaign. Barr made the appointment under a now-defunct independent counsel law that he'd severely criticized. The inquiry concluded in 1995 without charges against any officials. 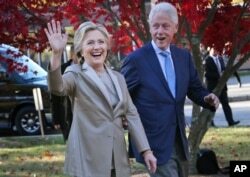 FILE - Then-Democratic presidential candidate Hillary Clinton and her husband, former President Bill Clinton, greet supporters after voting in Chappaqua, N.Y., Nov. 8, 2016. Hans von Spakovsky, a former Justice Department official who is now a senior fellow at the Heritage Foundation, a conservative public policy group in Washington, said Barr's handling of the investigations shows "he's not going to favor either political side of the aisle." "I don't think anyone has claimed that either one of those investigations was improperly handled or somehow gave a pass to the individuals being investigated," von Spakovsky said. Barr has spent the past 25 years largely out of the limelight, working as general counsel for two large telecommunication companies — GTE Corp. and Verizon Communications Inc. — and as a lawyer for the Kirkland & Ellis law firm. A registered Republican, he's given to GOP candidates in recent years. While he has steered clear of overtly partisan attacks on the Mueller investigation, Barr has expressed views about the probe that echo those of Trump. After Trump fired then-FBI Director James Comey in May 2017, Barr published an opinion piece supporting the controversial action. He wrote that Comey had "crossed a line" when he announced the outcome of the FBI investigation of Clinton's use of a private email server, in violation of Justice Department protocol. Barr was equally critical of Mueller's retention of several career Justice Department officials and other lawyers who had contributed money to Democratic campaigns. Trump often refers to these lawyers as "17 Angry Democrats." "In my view, prosecutors who make political contributions are identifying fairly strongly with a political party," Barr told The Washington Post last year. "I would have liked to see him have more balance on this group." FILE - Special counsel Robert Mueller, in charge of investigating Russian interference in the 2016 U.S. presidential election and possible collusion between Moscow and the Trump campaign, departs Capitol Hill, in Washington, June 21, 2017. Campaign records show that Barr has made campaign contributions to Republican Party committees and candidates in recent years, including $55,000 to the failed presidential campaign of Trump's rival, Jeb Bush, the elder Bush's second-oldest son. Campaign donations do not disqualify nominees. But generating controversy is Barr's support for the opening of an investigation into the Uranium One controversy, the allegation that former Secretary of State Hillary Clinton facilitated the sale of an American uranium company to a Russian firm in return for donations to the Clinton Foundation. Barr told The New York Times last November that there were more grounds to investigate the Uranium One deal than alleged collusion between the Trump campaign and Russia, which is at the heart of the Mueller investigation. Despite vehement Democratic opposition to such an inquiry, the likelihood that the Justice Department, under Barr, would investigate the Uranium One deal and Clinton's use of a private email server has grown, according to von Spakovsky.